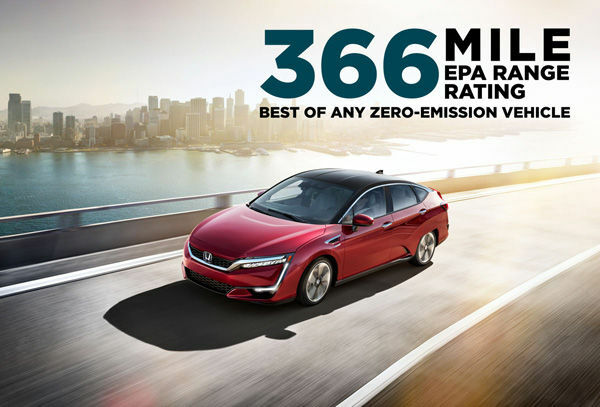 When Honda’s Clarity Fuel Cell goes on sale later this year, in California, it will not only have the longest range of any zero-emissions vehicles available (366 miles), but it will be also be a rather affordable way to get into a fuel-cell vehicle. The carmakers announces $369 per month lease deal, which undercuts the Hyundai Tucson Fuel Cell’s $499 per month deal. Honda’s 36-month lease term requires $2,499 plus the first month’s lease payment at signing. Included with the lease is $15,000 of hydrogen fuel over the three years, 20,000 miles annual mileage allowance, 21 days of an Avis luxury rental car and roadside assistance. The 2017 Clarity Fuel Cell will only be available in the Golden State through one of Honda’s 12 approved fuel cell vehicle dealerships.